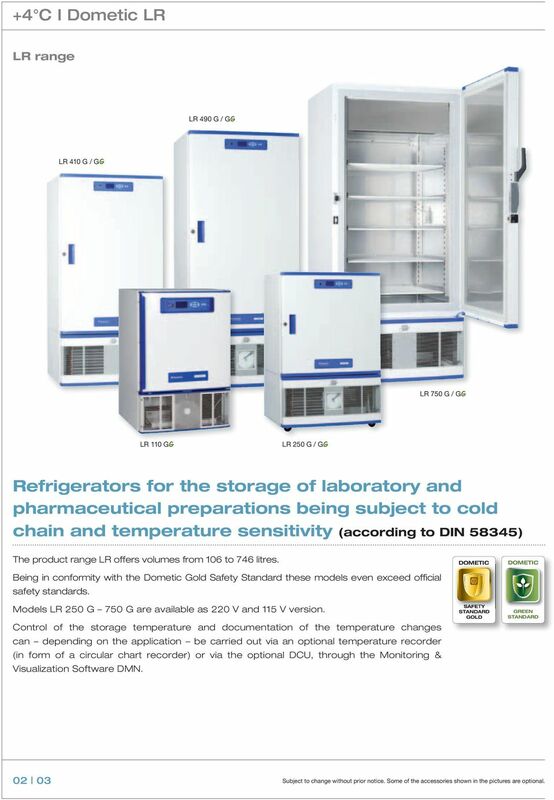 Download "LABORATORY / MEDICINE / PHARMACEUTICAL REFRIGERATORS"
2 +4 C I Dometic LR LR range LR 490 G / GG LR 410 G / GG LR 750 G / GG LR 110 GG LR 250 G / GG Refrigerators for the storage of laboratory and pharmaceutical preparations being subject to cold chain and temperature sensitivity (according to DIN 58345) The product range LR offers volumes from 106 to 746 litres. 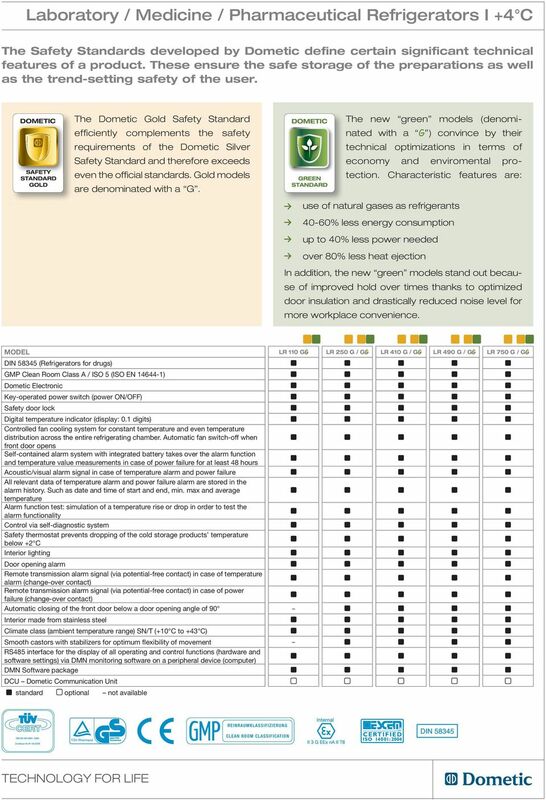 Being in conformity with the Dometic Gold Safety Standard these models even exceed official safety standards. Models LR 250 G 750 G are available as 220 V and 115 V version. 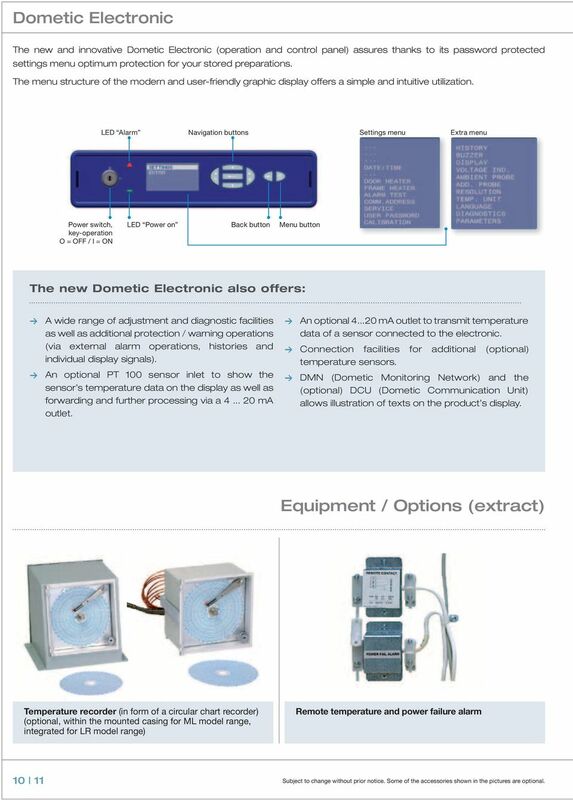 Control of the storage temperature and documentation of the temperature changes can depending on the application be carried out via an optional temperature recorder (in form of a circular chart recorder) or via the optional DCU, through the Monitoring & Visualization Software DMN. SAFETY GOLD GREEN Subject to change without prior notice. Some of the accessories shown in the pictures are optional. 4 Technical Data LR 110 GG LR 250 G / GG SAFETY GOLD GREEN Gross volume 106 l 246 l Net volume 92 l 167 l External dimensions (H x W x D) 820 x 560 x 580 mm 1305 x 850 x 785 mm Inner dimensions (H x W x D) 495 x 470 x 455 mm 655 x 680 x 552 mm Net weight (with standard equipment) 69 kg 135/131 kg Set temperature (preset) +4 C +4 C Set temperature (setting range) can be adjusted in steps of 0.1 C +4 C to +15 C +4 C to +15 C Cold alarm limit (preset) +2 C +2 C Warm alarm limit (preset) +6 C +6 C Control sensor PT WIRE 1/3DIN CL.B PT WIRE 1/3DIN CL.B Precision (from 80 C to +180 C) ± 0,2 C ± 0,2 C Display sensor, optional PT WIRE 1/3DIN CL.B PT WIRE 1/3DIN CL.B Precision (from 80 C to +180 C) ± 0,2 C ± 0,2 C Frequency V 50/60 Hz 50/60 Hz 50 Hz Frequency 115 V 60 Hz Power V 80 W 215 W 120 W Power 115 V 295 W Energy consumption V 0.75 kwh/24h 1.40 kwh/24h 0.90 kwh/24h Energy consumption 115 V 1.30 kwh/24h Heat emission V 14 Kcal/h 26 Kcal/h 21 Kcal/h Heat emission 115 V 33 Kcal/h Compressor running time V 20% 15% 20% Compressor running time 115 V 13% Noise level (at 1m height & 1m distance) V 41 db(a) 49 db(a) 42 db(a) Noise level (at 1m height & 1m distance) 115 V 55 db(a) Accu data / function time of the control panel when power failure 12V 7 AH / 48 hours 12V 7 AH / 48 hours Climate class (ambiant temperature range) SN/T (+10 C to +43 C) SN/T (+10 C to +43 C) Relative humidity range 75% 75% Defrosting technique natural natural Refrigerant type R600a R134a R600a Door insulation (polyurethane) 45 mm PU + 20 mm VIP 100 mm Casing insulation (polyurethane) 25 mm PU + 20 mm VIP mm Hold over time 130 min (from +4 C to +10 C) 228 min (from +4 C to +10 C) Safety class I I EMC directive 2004 / 108 / EEC 2004 / 108 / EEC Low voltage directive 2006 / 95 / EEC 2006 / 95 / EEC GMP clean room classification A / ISO 5 A / ISO 5 Material inner body Stainless steel (V2A ) Stainless steel (V2A ) Material outer casing & door Galvanized sheet steel Galvanized sheet steel (STO2Z-AZ150) (STO2Z-AZ150) Material Drawers Stainless steel (V2A ) Stainless steel (V2A ) Material Wire Shelves Wire DIN 172-2, PA11 coated Wire DIN 172-2, PA11 coated Material N-Rack Polycarbonate, transparent Color outer casing White (similar RAL 9010) White (similar RAL 9010) Color contrasts Blue (similar RAL 5002) Blue (similar RAL 5002) ATEX category III, zone 2, interior (without light, only with inox wire shelves) Interior Equipment & Options (Concerning further information on accessories please see our separate leaflet Racking & Storage Systems ) Standard interior equipment 2 Wire Shelves 2 Wire Shelves RS485 interface DMN Software package DCU LAN/WLAN Ambient temperature sensor Potential-free contact in case of power failure Integrated inlet for external sensor (installed by customer) Additional reference bottle with reference fluid and fitting Condenser filter Smooth castors with stabilizers for optimum flexibility of movement Interior lighting Integrated temperature recorder in form of a circular chart recorder/recording range: 10 C to +20 C for 24h or 7 days for 24h or 7 days External water cooling Door hinge right Door hinge left Wooden packaging for ocean transport / export standard / optional / not available All values were measured at +25 C ambient temperature and without load (with inertial mass) Subject to change without prior notice. Some of the accessories shown in the pictures are optional. 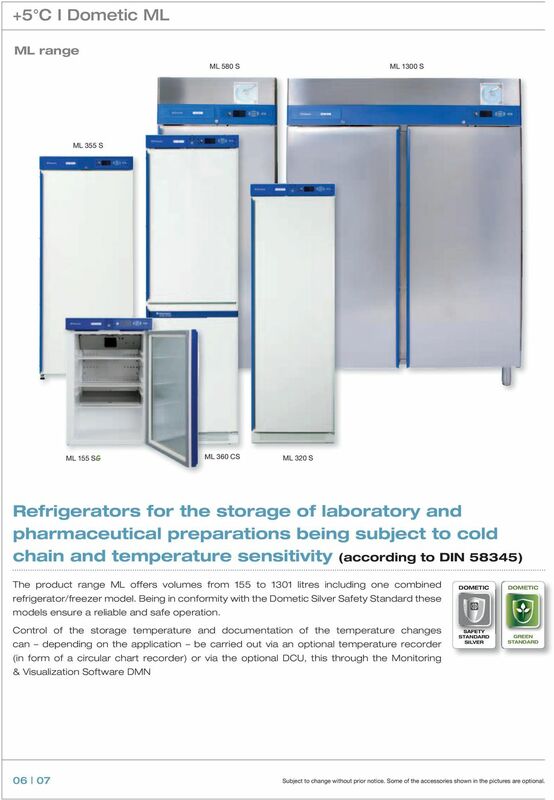 6 +5 C I Dometic ML ML range ML 580 S ML 1300 S ML 355 S ML 155 SG ML 360 CS ML 320 S Refrigerators for the storage of laboratory and pharmaceutical preparations being subject to cold chain and temperature sensitivity (according to DIN 58345) The product range ML offers volumes from 155 to 1301 litres including one combined refrigerator/freezer model. Being in conformity with the Dometic Silver Safety Standard these models ensure a reliable and safe operation. Control of the storage temperature and documentation of the temperature changes can depending on the application be carried out via an optional temperature recorder (in form of a circular chart recorder) or via the optional DCU, this through the Monitoring & Visualization Software DMN SAFETY SILVER GREEN Subject to change without prior notice. Some of the accessories shown in the pictures are optional. 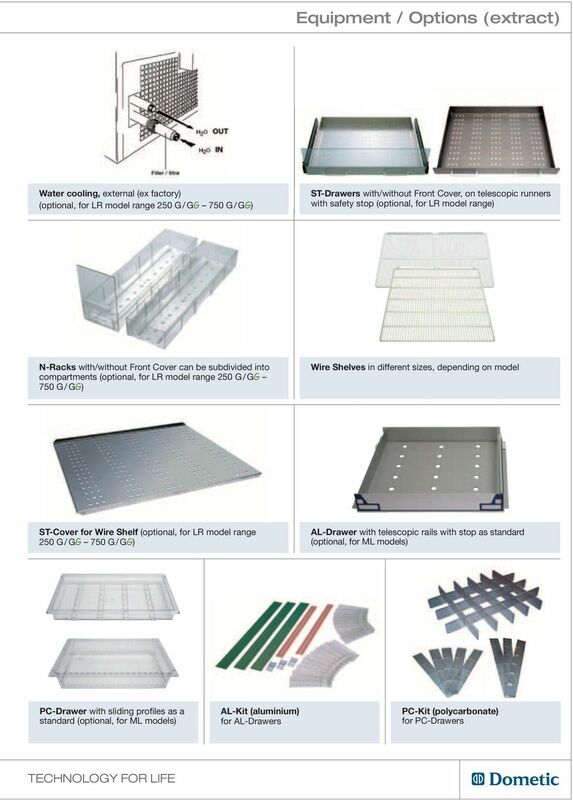 8 Technical Data ML 155 SG ML 320 S SAFETY SILVER GREEN Gross volume 155 l 322 l Net volume 141 l 274 l External dimensions (H x W x D) 900 x 595 x 630 mm 1830 x 595 x 605 mm External dimensions (H x W x D) (with mounted temperature recorder) 1075 x 595 x 630 mm 1990 x 595 x 605 mm Inner dimensions (H x W x D) 745 x 495 x 455 mm 1496 x 500 x 455 mm Net weight (with standard equipment) 46 kg 80 kg Set temperature (preset) +5 C +5 C Set temperature (setting range) can be adjusted in steps of 0.1 C +4 C to +15 C +4 C to +15 C Temperature cold alarm limit (preset) +2 C +2 C Temperature warm alarm limit (preset) +8 C +8 C Control sensor PT WIRE 1/3DIN CL.B PT WIRE 1/3DIN CL.B Precision (from 80 C to +180 C) ± 0,2 C ± 0,2 C Display sensor, optional PT WIRE 1/3DIN CL.B PT WIRE 1/3DIN CL.B Precision (from 80 C to +180 C) ± 0,2 C ± 0,2 C Voltage V - 50Hz (10A) V - 50/60Hz (10A) Power 70 W 140 W Energy consumption 0.54 kwh /24h 1.10 kwh /24h Heat emission 12 Kcal/h 120 Kcal/h Compressor running time 20% 29% Noise level (at 1m height & 1m distance) 41 db(a) 42 db(a) Accu data / function time of the control panel when power failure 12V 7Ah / 48 hours 12V 7Ah / 48 hours Climate class (ambiant temperature range) SN / ST (+10 C to +38 C) SN / ST (+10 C to +38 C) Relative humidity 75% 75% Defrosting technique natural natural Refrigerant type R600a R134a Door insulation (polyurethane) 90 mm 70 mm Casing insulation (polyurethane) mm mm Hold over time 70 min (from +5 C to +10 C) 60 min (from +5 C to +10 C) Safety class I I EMC directive 2004 / 108 / EEC 2004 / 108 / EEC Low voltage directive 2006 / 95 / EEC 2006 / 95 / EEC GMP - clean room classification B / ISO 6 B / ISO 6 Material inner body Polystyrene (PS) Styrene (SAN) Material outer casing and door Galvanized sheet steel Galvanized sheet steel (STO2Z AZ150) (STO2Z AZ150) Material Drawers Polycarbonate, transparent Polycarbonate, transparent Material Wire Shelves Wire DIN 172-2, PA11 coated Wire DIN 172-2, PA11 coated Color outer casing White (similar RAL 9010) White (similar RAL 9010) Color contrasts Blue (similar RAL 5002) Blue (similar RAL 5002) ATEX category III, zone 2, interior option, without light, only with inox wire shelves option, without light, only with inox wire shelves Interior Equipment & Options (Concerning further information on accessories please see our separate leaflet Racking & Storage Systems ) Standard interior equipment 3 Wire Shelves 6 Wire Shelves RS 485 interface DMN Software package DCU - Dometic Communication Unit Ambient temperature sensor Potential-free contact in case of power failure Integrated inlet for external sensor (installed by customer) Additional reference bottle with reference fluid and fitting Interior lighting Smooth castors with stabilizers Temperature recorder in form of a circular chart recorder / recording range: 10 C to +20 C Mounted, for 24h or 7 days Mounted, for 24h or 7 days Door hinge right Door hinge left Wooden packaging for ocean transport / export standard / optional / not available All values were measured at +25 C ambient temperature and without load (with inertial mass) Subject to change without prior notice. Some of the accessories shown in the pictures are optional. 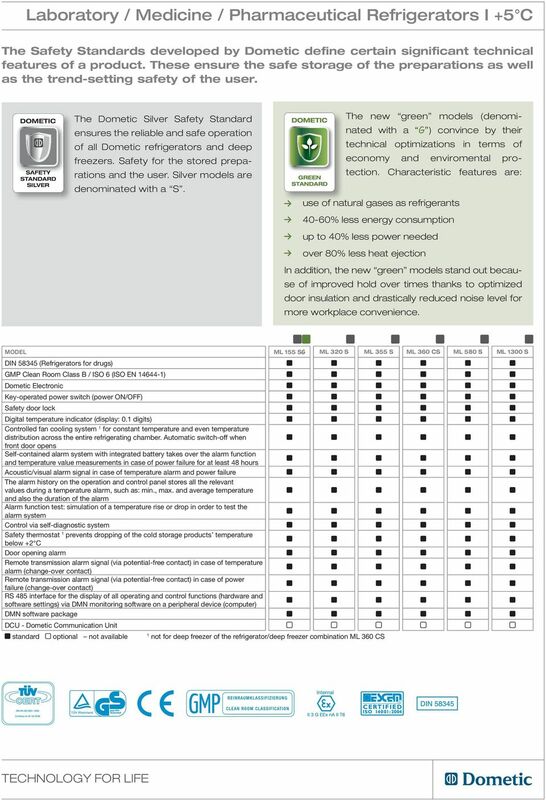 10 Dometic Electronic The new and innovative Dometic Electronic (operation and control panel) assures thanks to its password protected settings menu optimum protection for your stored preparations. The menu structure of the modern and user-friendly graphic display offers a simple and intuitive utilization. LED Alarm Navigation buttons Settings menu Extra menu Power switch, key-operation O = OFF / I = ON LED Power on Back button Menu button The new Dometic Electronic also offers: A wide range of adjustment and diagnostic facilities as well as additional protection / warning operations (via external alarm operations, histories and individual display signals). An optional PT 100 sensor inlet to show the sensor s temperature data on the display as well as forwarding and further processing via a ma outlet. An optional ma outlet to transmit temperature data of a sensor connected to the electronic. Connection facilities for additional (optional) temperature sensors. 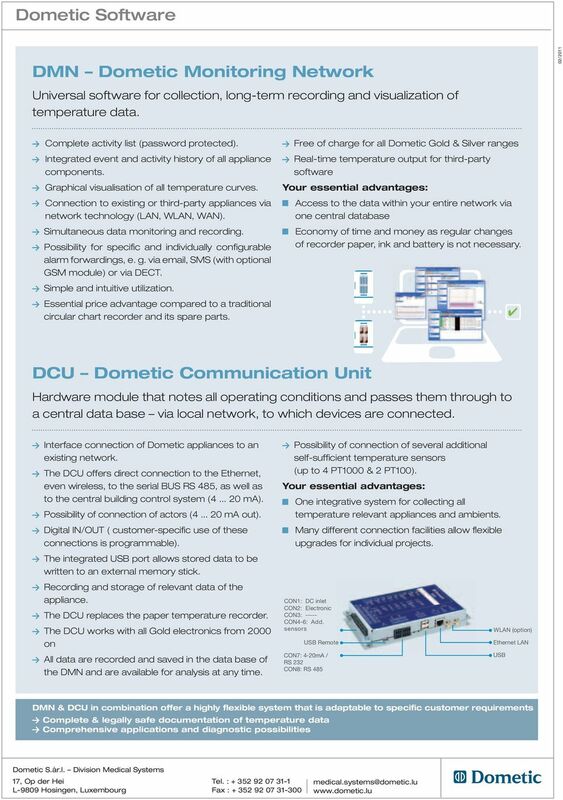 DMN (Dometic Monitoring Network) and the (optional) DCU (Dometic Communication Unit) allows illustration of texts on the product s display. 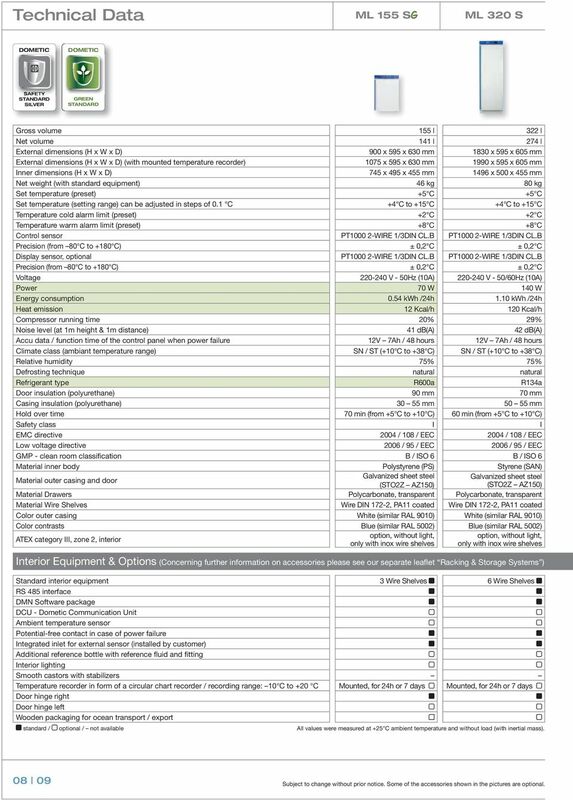 Equipment / Options (extract) Temperature recorder (in form of a circular chart recorder) (optional, within the mounted casing for ML model range, integrated for LR model range) Remote temperature and power failure alarm Subject to change without prior notice. Some of the accessories shown in the pictures are optional. 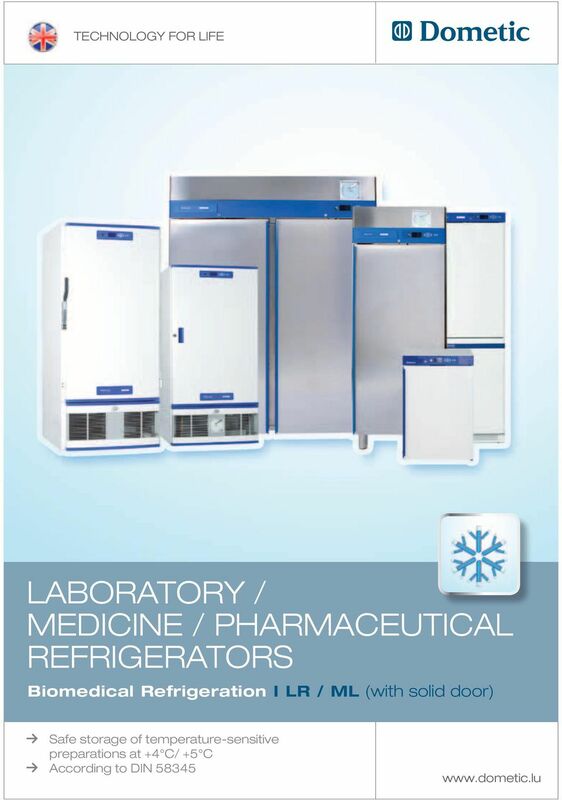 HettCube INCUBATORS AND COOLED INCUBATORS SUSTAINABLE. ERGONOMIC. HIGH QUALITY. Short Form Catalogue Alarm Systems Reliable Supervision and Control Alarm Monitors and Indicators The SELCO product range includes a number of alarm monitors and indicator panels for use in numerous applications. PANEL METER N15Z TYPE INSTRUCTION MANUAL CONTENTS 1. APPLICATION... 5 2. METER SET... 5 3. BASIC REQUIREMENTS, OPERATIONAL SAFETY... 6 4. INSTALLATION... 8 5. HANDLING... 10 6. SPECIFICATIONS...11 7.
is then retained absolutely without interruption. P R O D U C T I N F O R M A T I O N Barcode Reader Series BCL 31, BCL 32, BCL 34 BCL 31, BCL 32 and BCL 34: Barcode readers for universal use in conveyor and storage technology. 3 models: numerous advantages. KR25i HIGH SPEED, HIGH CAPACITY REFRIGERATED CENTRIFUGE AUTO-LOCK. CQCS Traceability System VIDEOset Display! Cell /Mobile phone home security system GSM HOME SECURITY SYSTEM Model : GSM-120 TABLE OF CONTENTS 1. FEATURES... 1 2. APPLICATION... 2 3. 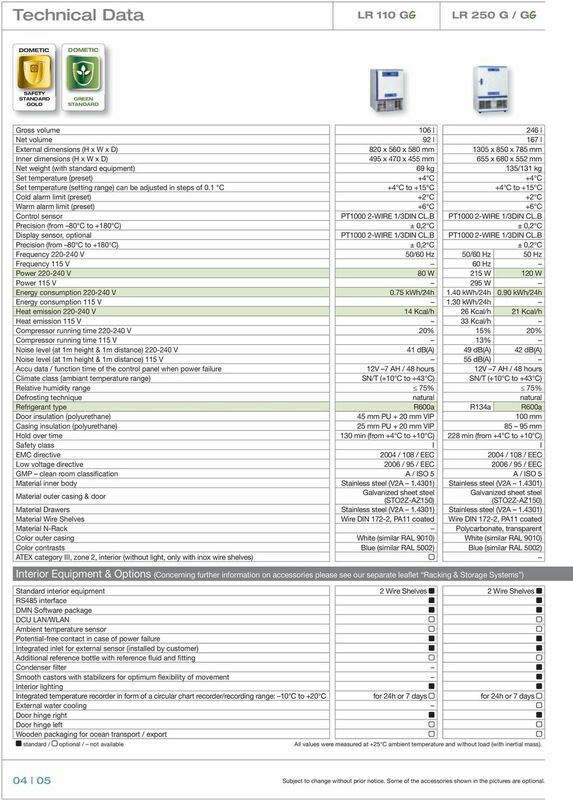 SPECIFICATIONS... 3 4. 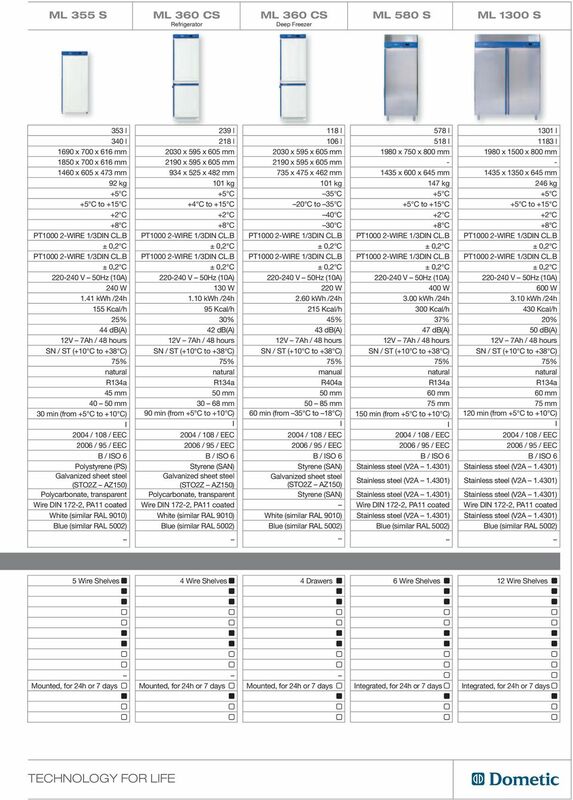 FRONT PANEL & LAYOUT DESCRIPTION...6 5. / Our accessories complement all PV systems, simplify installation and ensure that the system meets the required safety standards. -86 C Freezer Accessories. New Brunswick Freezer Accessories. A wide selection of racks, monitoring systems and more! ROOFTOP - HEAT PUMP UNIT. 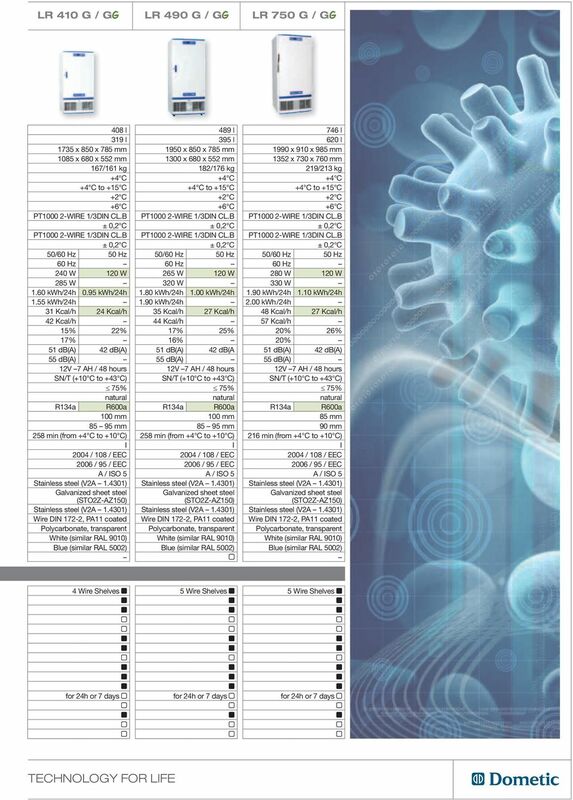 This document applies when installing into an air handler or as part of an air handling system. site monitoring Kit Site Monitoring Kit User Manual we prove it.